Inshore: Captain Patrick “Smiley” Kelly (843-361-7445) reports that the biggest news is that bull red drum in the 30-40 inch range are being caught consistently on live menhaden and finger mullet in the Inlet. 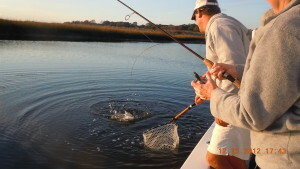 There continues to be a pretty consistent trout bite fishing shrimp under a popping cork in the ICW, and flounder fishing is still good with mullet fished on the bottom. Spanish mackerel and bluefish are also being caught on mullet fished in the inlets. Cherry Grove Pier (843-249-1625) reports that bluefish have been caught in the morning. Sporadic croaker and whiting as well as small black drum have also been landed. Inshore: Captain Patrick “Smiley” Kelly (843-361-7445) reports that there has been a pretty consistent trout bite fishing shrimp under a popping cork in the ICW. 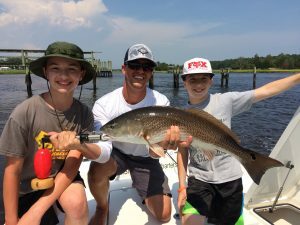 Perhaps because of the mullet run flounder fishing has been good with mullet fished on the bottom, and while slot-sized redfish have been hard to come by some very large fish up to 44 inches have been caught in the inlets. Mullet are the best bait for big drum right now. Spanish mackerel are also being caught on mullet fished in the inlets. 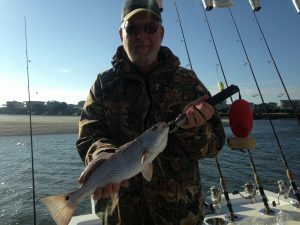 Cherry Grove Pier (843-249-1625) reports that with a mullet run in full force lots of bluefish are being caught as well as quite a few small redfish. Whiting and croaker are also fairly prolific. 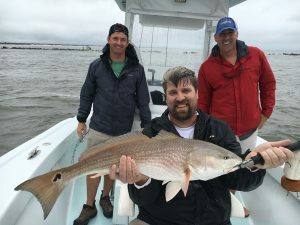 Inshore: Captain Patrick “Smiley” Kelly (843-361-7445) reports that redfish both under and over the slot are both biting well, with the smaller puppy drum taking live shrimp, finger mullet, and Gulp! baits and the bigger fish wanting cut or live mullet. Small black drum have been very abundant and they are eating both live shrimp and fresh, cut dead shrimp. Flounder fishing has been strong, with Gulp! shrimp fished on a ¼ ounce jighead producing (as well as live mud minnows/ finger mullet). A 9 ½ pound fish was caught on one of their boats on Gulp! last month! Trout are still taking topwater lures in the morning, and live shrimp fished under a popping cork as well as Gulp! on a ¼ ounce jighead are also working. Cherry Grove Pier (843-249-1625) reports that lots of smaller whiting, some small flounder, and pompano are being caught off the pier. Recently there was also a run of small spadefish but kings and Spanish have not been around since May. Nearshore Captain Smiley reports that lots of sharks (Atlantic Sharpnose, Blacktip) as well as kings and Spanish have been caught. 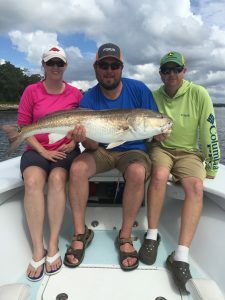 Inshore: Captain Patrick “Smiley” Kelly (843-361-7445) reports that trout fishing has been good on topwaters as well as live shrimp fished under a popping cork. Tons of small black drum as well as some good-sized sheepshead have been falling prey to live shrimp, and nice flounder have been caught on live minnows, menhaden and Gulp! baits. Slot-sized reds have been a little hard to locate but big fish over the slot are being caught on large menhaden in the channels. Cherry Grove Pier (843-249-1625) reports that catches off the pier have been pretty good. In addition to lots of whiting, croaker and a few spots, some very nice flounder in the 24-inch range were caught last week and a bunch in the 16-inch range have been caught this week. There has been a decent run of bluefish, a few Spanish mackerel caught, and about an hour ago a huge tarpon was jumped! 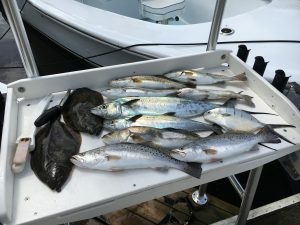 Nearshore: Smiley reports that they are catching Spanish mackerel out by the jetties as well as lots of Atlantic sharpnose sharks, blacktip sharps and some king mackerel at the reefs. Red drum can also be found just beyond the breakers on menhaden balls. Inshore: Captain Patrick “Smiley” Kelly (843-361-7445) reports that lots of small black drum are being caught in the ICW on live and fresh cut shrimp. 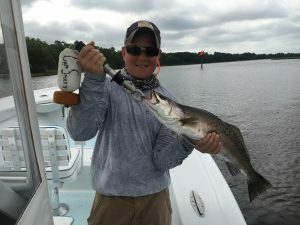 Some good trout have been caught on live shrimp fished under popping corks as well as topwater plugs, and a few redfish have been caught on live menhaden and mud minnows. Flounder catches are still good on mud minnows and Gulp! baits. Cherry Grove Pier (843-249-1625) reports that they have had good catches of whiting and croaker, as well as a few spotted seatrout and pompano. Some random Spanish mackerel have also been picked up. Inshore: Captain Patrick Smiley (843-361-7445) reports that lots of 12-15 inch flounder are being caught on mud minnows and Gulp! baits. Some nice trout are also being caught on imitation shrimp as well as live shrimp fished under a popping cork. Good numbers of black drum are being caught on fresh dead shrimp, and while slot-sized redfish are few and far between some bigger red drum are being caught around menhaden schools on live and cut menhaden fished on the bottom. Cherry Grove Pier (843-249-1625) reports that bluefish, including some nice-sized fish, are being caught. There have been pretty good numbers of Spanish including some keepers, as well as whiting, croaker, small perch and a couple of small black drum. A few small flounder are being caught but king mackerel have not yet showed up. Nearshore: Captain Patrick Smiley reports that cobia, Spanish mackerel and bluefish are all being caught. With water temperatures rising there are also some big blacktip sharks over 100 pounds around, and there are also plenty of spiny dogfish. Black sea bass and flounder are also being caught. 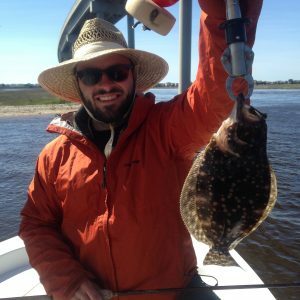 Inshore: Captain Patrick Smiley (843-361-7445) reports that undersized flounder as well as some keepers are being caught in the area on mud minnows and Gulp! baits. Some nice trout up to 3+ pounds have been caught recently on Vudu Shrimp as well as mud minnows, and a few redfish under 23 inches have been landed. Lots of small black drum are around, and both black drum and redfish will eat fresh shrimp as well as crabs. Nearshore: Captain Patrick Smiley reports that bluefish and Spanish are both around in good numbers at the reefs, and they will eat live bait as well as jigs and plugs. Local fishing has been pretty good out there the last couple of weeks. We are not breaking records but I’d say fishing is better now than I have seen the past couple years in early spring. A mild winter was a big help. I’m noticing some decent Speckled Trout action in my usual spots as well as Black Drum. A few reds are also being caught if you slip up on them on the right tides. Mud minnows have been great on Southern Flounder. We are getting the numbers on the fish but size have a little on the short side which is typical for early spring. Bookings are looking pretty good this year which is important for me so I can pull this off for a living. If you are planning your trip to the Grand Strand area please book your fishing well in advance. This make sixteen years for me fishing for my living and I thank all of y’all for your support. I’m a very lucky man. Fishing this month has been a roller coaster of event’s. We here in South Carolina received a tropical rain that I have never witnessed in my lifetime. Hurricane Jaquin showered us with over two feet of rain with in a 36 hour window. Several lives were lost due to flooding and many homes destroyed up the river from us. Thankfully here at the coast we are close to the ocean and rivers with the tides wash away quickly. I honestly thought I might be out of business the first day I had a trip scheduled after the storm. We had a corporate group and they new what they were getting themselves into… frankly they wanted to get outside just like me . I Kind of get cabin fever when it rains for three to four days in a row. Started fishing out at the Inlet and bam the fish were biting!!. Big Red Drum were feeding hard…It was a great day!! Honestly the fishing has been up and down but it as of the past couple of days has really been good. We are now on our regular fall bite with plenty of redfish ,flounder and trout. November is always a great time to fish!! Locals know this and I have many regulars that come back year after year. If your on vacation or coming give me a call and let’s get on a hot fall bite!! I must say Captain Smiley Charters has had a awesome summer. Business has been great and the fishing has been awesome. 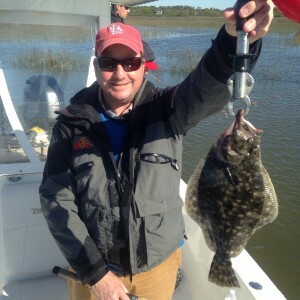 We really did well with flounder this summer and seemed that they were a staple of about every trip. The Speckled Trout also have been biting really well this season. Live shrimp are abundant and so are finger mullet, these are the primary baits I have been using . The last week or so the Lizard Fish have been thick in the tidal waters and will destroy any bait you put out there…. You have to move away from them! The best tide as of lately have been the low to rising. This past week when the tide has been going out it’s been a little slow but that is not always the case. Fall charter booking are up this year so please don’t wait for the last minute. Give me a call and let’s go fishing!